A real relic dating back to the Dinosaur days. Known for its many health benefits including memory function and antioxidant properties. Unique conifer/fern-like evergreen tree that makes a real statement - easy to maintain with pruning. Bright, fresh green leaves in the spring that turn an eye-catching yellow in the autumn. Supplied as a potted plant in a 9cm pot ready 20cm tall to plant out or pot into a larger container. A real relic, Gingko biloba, also known as Maidenhair Tree, was long around before man but is more popular than ever right now! 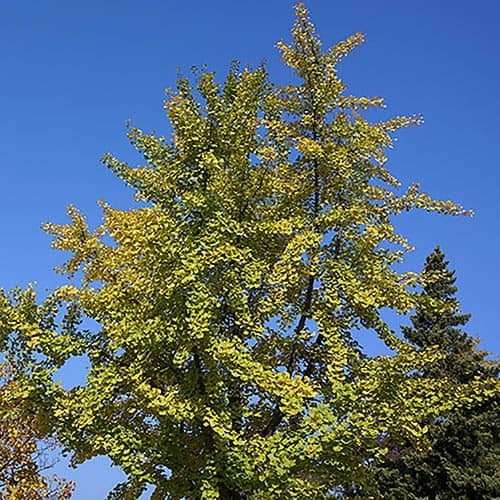 Known for its many health benefits thanks to its use in Chinese medicine, and now in western medicine, Gingko biloba is a truly unique conifer/fern-like deciduous tree that makes a real statement. With bright, fresh green leaves in the spring that often turn an eye-catching yellow in the autumn, the Gingko biloba tree makes a magnificent centre piece and will grow up to 10m tall if left alone - but don't let this put you off if you don't have much space as it can be easily pruned and trimmed to keep to a manageable shape and size! It's a very hardy tree and will thrive in a sunny spot in a UK garden.